Body from carbon tube - fiber. Stainless tip. Bohning "X" vanes. Front diameter on fiber: 12,5 mm. Tip lenght: 40 mm. End dia: 11 mm. Total Lenght: 205 mm. Weight: ~ 28 gram. Front diameter on fiber: 14 mm, Tip lenght 40 mm, End dia: 12 mm, Total Lenght: 225 mm, Weight: ~ 35 gram. Body from carbon tube - fiber.Stainless tip. Special shaped natural vanes. Body from special wood. Stainless tip. Brass ring at the end. 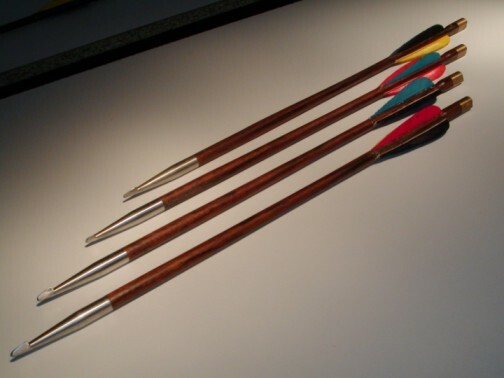 Bohning "X" vanes. Front diameter on fiber: 14 mm. Tip lenght: 40 mm. End dia: 12 mm. Total Lenght: 240 mm. Weight: ~ 32 gram. Body from special wood. Stainless tip. Brass ring at the end. 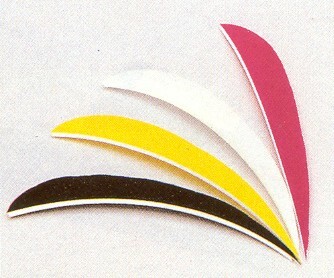 Special shaped natural vanes. Front diameter: 15 mm. Tip lenght: 55 mm. End dia: 12 mm. Total Lenght: 300 mm, Weight: ~ 56 gram. Front diameter: 15 mm. Tip lenght: 55 mm. End dia: 12 mm. Total Lenght: 300 mm. Weight: ~ 56 gram. Body from special wood. Stainless flat tip. Brass ring at the end. Special shaped natural vanes. Tip diameter: 14 mm. Tip lenght: 50 mm. End ring dia: 12 mm. Total Lenght: 245 mm. Weight: ~ 54 gram. Tip diameter: 11 mm. Tip lenght: 70 mm. End ring dia: 12 mm. Total Lenght: 450 mm. Weight: ~ 56 gram.